Guarana is a plant of the Amazon that is found in parts of Venezuela and Brazil. The berries of this plant have a number of health benefits, including the ability to burn fat and increase energy, among others. Today's common use of guarana is in energy drinks and sports nutrition drinks due to its energizing effects. Be sure to consult your health-care provider for complete information about guarana and its effects. One of the most powerful benefits of guarana is its energizing effects. Guarana has a similar chemical structure to that of caffeine, and the plant seeds provide even higher caffeine effects than typical caffeine drinks, including coffee. Guarana may be more effective than coffee with regards to its energizing power, as guarana is released more slowly into the body to provide sustained energy. The plant directly stimulates the central nervous system and may be taken in small doses to fight fatigue and increase activity levels. Guarana has been used for centuries, as the early natives would use it to make teas that would suppress hunger for weight loss. Guarana is used today in certain energy drinks and weight loss supplements to support weight loss by providing stimulation and combating hunger. Guarana may promote weight loss by kick starting the nervous system to induce the process of lipolysis. This process involves the release of fat into the blood stream where it is used as energy during exercise. In addition to its energizing and weight loss effects, guarana also provides a number of medical benefits for the body, according to GuaranaStudies.com. Guarana encourages movement of the bowels, which is a beneficial effect for people suffering from constipation. Additionally, guarana is effective for treating other complications of the bowels, including gas and diarrhea, as it helps to detoxify and cleanse the system. According to Drugs.com, guarana comes in a variety of forms. 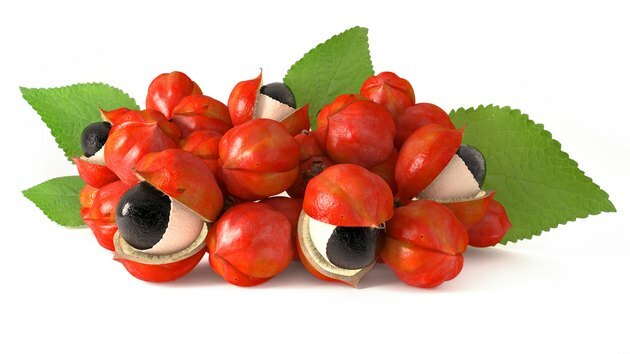 In its most natural form, guarana is a dried paste made from the seeds of the plant. It is commercially available as syrups, extracts, pill or capsule supplements, and additives for energy drinks. When incorporated into weight loss products, it is typically combined with ephedra, another weight loss stimulant. Consult your health-care provider for more information about forms of guarana and dosage information.